But the dog was discovered living with new owners by the Oregon Innocence Project, who were reviewing his case. The original trial had not had a unanimous verdict and the non-profit legal organisation said their review of the trial evidence had raised "several red flags". They originally raised concerns with a local district attorney, John Hummel, about Mr Horner's case in April, who agreed to work with them on a joint basis. A critical discrepancy regarded the dog's whereabouts. Mr Horner insisted the dog was still alive, evidence that could prove the alleged victim had lied in her allegations. An Oregon Innocence Project's investigator and a member of the local district attorney's office made a number of trips to try to hunt down the dog's new owner. They eventually found him and the dog miles away on the state's coast. "She was drinking a bowl of water and sitting in shade underneath a porch. We played with her. Petted her. It was wonderful," Lisa Christon, a volunteer for the legal organisation, said. The dog's identity was reportedly verified through her distinctive appearance and evidence about her custody. "Lucy the dog was not shot. Lucy the dog is alive and well," the district attorney's office said in its motion to dismiss. "My investigator and the investigator from the Oregon Innocence Project tracked down Lucy the dog, verified her identity, spent much time with her, and took pictures of her." A decision at the state's Court of Appeals allowed Mr Horner to be freed initially in August, and a new trial was ordered. 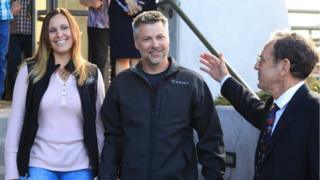 He said he and his wife were now "ready to pick up the pieces of our lives" following his release.